Hello friends! 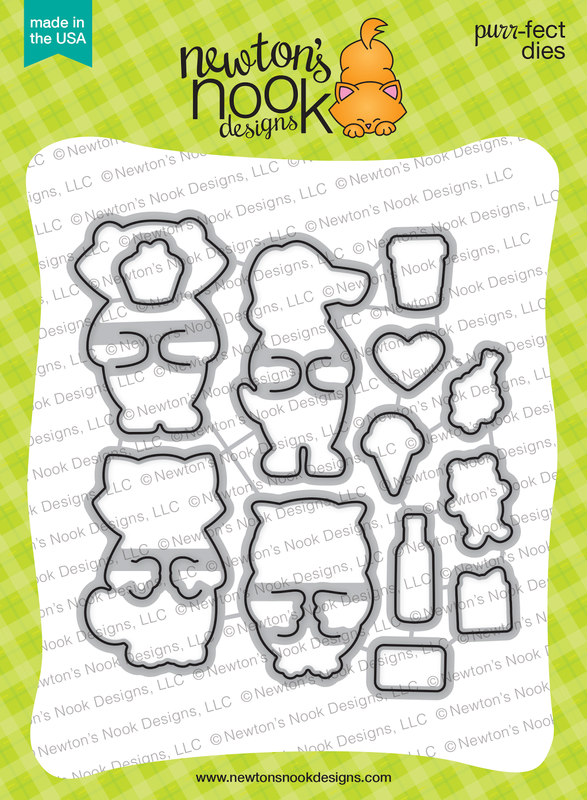 I'm so excited that you're joining me for Day 2 of Newton's Nook Designs January Release! 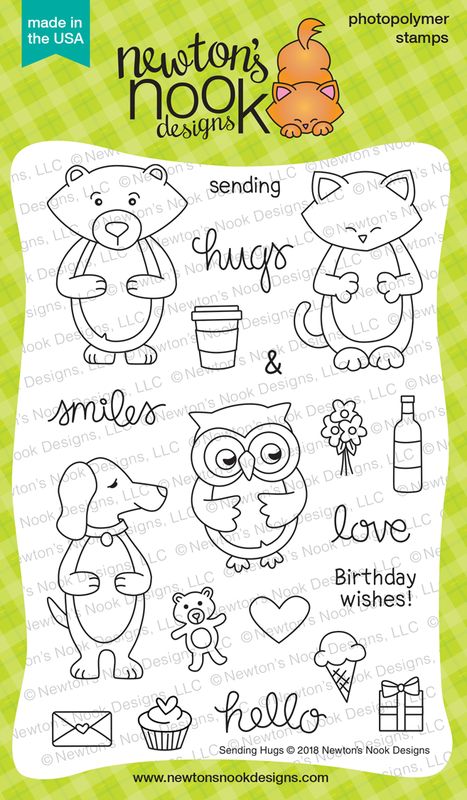 Today, I'm sharing a Birthday Wishes Card I created using the brand new Sending Hugs stamp and die set. I couldn't resist stamping, coloring and die cutting the entire crew to help celebrate this special day. I love that each critter has a die that cuts it's arms so that it can hold a variety of objects ranging from a cupcake to a teddy bear! I knew I wanted to make a birthday card, so I went with some cupcakes and presents. I've recently been cleaning and purging my craft room and during this process I came across some die cut picture frames I had cut and put to the side for some unknown future project. As soon as I saw them, I immediately thought it would be so fun to place all the critters inside the frame. With that idea in mind, I stamped the sentiment on the base of the frame and added a couple of presents. Once all the stamping, color and die cutting was complete, I arranged the crew behind the die cut picture frame. I used double sided foam adhesive to attach the frame piece to the card front. I adhered the adhesive all around the back side of the frame. I then placed a piece of it behind the each of the two critters in the very front to add bit more depth to the design. 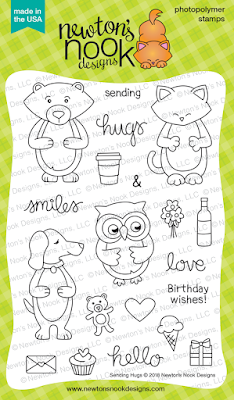 Would you like to win the “Sending Hugs” Stamp Set? This stamp set will be given away to ONE lucky winner! If you said yes, all you have to do is comment on the Newton's Nook blog and Design Team blogs (see list below)! The winner will be chosen at random from the collective reveal posts. Make sure to check out each of their blogs and comment for your chance to win. You will not know which blog has been chosen so the more you comment on the better your chances are of winning! You have until Thursday January 18th at 9pm EST to comment -- winners will be announced on the Newton's Nook blog on Friday, January 19th. What a great idea!!! This card turned out soooo adorable! Great design and layout!!!! This card is so cute! I love the snapshot of what looks like a very fun birthday party! This is absolutely amazing! Love how all the critters are looking at the camera and smiling at the same time. Wish my photo subjects would...ha ha! Seriously, I adore this creative card!!!! Darling card! Your coloring looks terrific and I love the choice of patterned papers. This is adorable! Love how you’ve set them up in the photo frame. Fun, colorful card! This is an Ammmmmazing way to use this set. Love it! This is fabulous! It's a perfect party snapshot! Great for a birthday greeting! Such a cute card! I love the group of them all together! 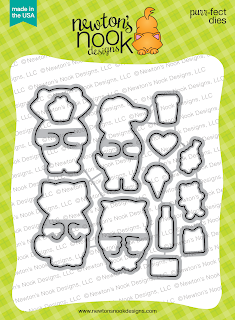 This is an awesome stamp set - a must-have for me! Just everything about this! The polaroid frame is perfect for the "groupie" photo! I love your paper choices too. So cute with all of these critters in the frame. So cute! Love the photo of all the critters! They have so many fun props to hold! What a fab group of friends to celebrate a birthday! Your colouring is lovely. So much fun with them all crowded into the frame!!! Love this. Cute card, love the group of animals. The Polaroid is great. Was this from a die shape? I am thinking of so many ideas. Wow, look at all those layers! What an awesome idea to place them all int the photo frame! They looks so happy all bundled up there together! Cool idea! What a super cute card. I love how just a scrap of an idea becomes such a great card. Fantastic card! I love the rainbow striped paper showing on the sides! Oh my ! Your card is absolutely precious !